features masses of fancy pink and white striped flowers. Highly scented double flowers, repeat flowering. Blue silver foliage. Perfect for containers, borders, mass landscape planting, cut flowers. • Est. USDA Zone 5, (-20°F or -28°C). 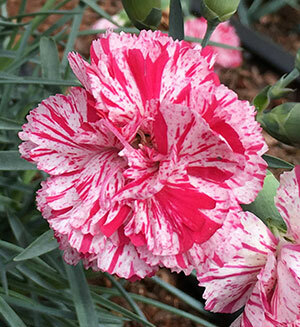 • Standout unique variety with fancy pink and white striped blooms. • Masses of double spicy fragrant flowers carried on sturdy stems. Repeat flowering. • Blooms Spring through fall. • Compact mounding habit 12" x 12".